The weightingFilter System object™ performs frequency-weighted filtering independently across each input channel. Create the weightingFilter object and set its properties. weightFilt = weightingFilter creates a System object, weightFilt, that performs frequency-weighted filtering independently across each input channel. weightFilt = weightingFilter(weightType) sets the Method property to weightType. weightFilt = weightingFilter(weightType,Fs) sets the SampleRate property to Fs. weightFilt = weightingFilter(___,Name,Value) sets each property Name to the specified Value. Unspecified properties have default values. Example: weightFilt = weightingFilter('C-weighting','SampleRate',96000) creates a C-weighting filter with a sample rate of 96,000 Hz. Type of weighting, specified as 'A-weighting', 'C-weighting', or 'K-weighting'. See Algorithms for more information. audioOut = weightFilt(audioIn) applies frequency-weighted filtering to the input signal, audioIn, and returns the filtered signal, audioOut. The type of filtering is specified by the algorithm and properties of the weightingFilter System object, weightFilt. Audio input to the weighting filter, specified as a matrix. The columns of the matrix are treated as independent audio channels. Audio output from the weighting filter, returned as a matrix the same size as audioIn. Check the compliance status of filter designs and visualize them. Create an A-weighting filter with a 22.5 kHz sample rate. Verify that the filter is standard compliant and visualize the filter design. Change your A-weighting filter sample rate to 44.1 kHz. Verify that the filter is standard compliant and visualize the filter design. Use the weightingFilter System object™ to design an A-weighted filter, and then process an audio signal using your frequency-weighted filter design. Create a weightingFilter System object. Use the sample rate of the reader as the sample rate of the weighting filter. Visualize the filter response and verify that it fits within the class 1 mask of the IEC 61672-1:2002 standard. Create a spectrum analyzer to visualize the original audio signal and the audio signal after frequency-weighted filtering. Compare the A-weighted, C-weighted, and K-weighted filtering of an engine sound. Create an A-weighting filter, a C-weighting filter, and a K-weighting filter. Visualize the filters for analysis and comparison. Create a dsp.AudioFileReader and specify a sound file. Create an audioDeviceWriter with default properties. In an audio stream loop, play the white noise, and then listen to it filtered through the A-weighted, C-weighted, and K-weighted filters, successively. 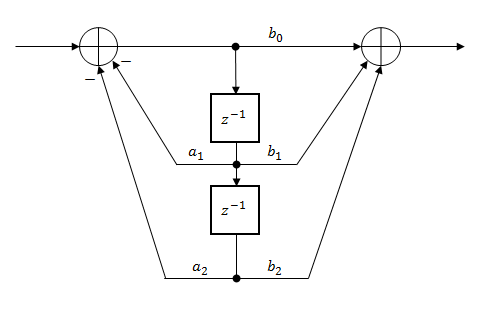 The weightingFilter object uses second-order sections (SOS) for filtering. To extract the weighting filter design, use getFilter to return a dsp.BiquadFilter object with the SOSMatrix and ScaleValues properties set. Use weightingFilter to create C-weighted and A-weighted filter objects. Use getFilter to return corresponding dsp.BiquadFilter objects. Create an audio file reader and audio device writer for audio input/output. Use the sample rate of your reader as the sample rate of your writer. In an audio stream loop, play the unfiltered signal. Release your file reader so that the next time you call it, it reads from the beginning of the file. Play the signal processed by the A-weighted filter. Then play the signal processed by the C-weighted filter. Cache the power in each frame of the original and filtered signals for analysis. As a best practice, release your file reader and device writer once complete. Plot the power of the original signal, the A-weighted signal, and the C-weighted signal over time. The A-curve is a wide bandpass filter centered at 2.5 kHz, with approximately 20 dB attenuation at 100 Hz and 10 dB attenuation at 20 kHz. A-weighted SPL measurements of noise level are increasingly found in sales literature for domestic appliances. In most countries, the use of A-weighting is mandated for the protection of workers against noise-induced deafness. The ISO and ICOA standards mandate A-weighting for all civil aircraft noise measurements. The ANSI S1.42.2001  defines this weighting curve. The IEC 61672-1:2002  standard defines the minimum and maximum attenuation limits for an A-weighting filter. The C-curve is "flat," but with limited bandwidth: It has –3 dB corners at 31.5 Hz and 8 kHz. C-curves are used in sound level meters for sounds that are louder than those intended for A-weighting filters. The ANSI S1.42-2001  defines the C-weighting curve. The IEC 61672-1:2002  standard defines the minimum and maximum attenuation limits for C-weighting filters. The K-weighting filter is used for loudness normalization in broadcast. It is composed of two stages of filtering: a first stage shelving filter and a second stage highpass filter. The ITU-R BS.1770-4  standard defines this curve. The table shows the coefficients for the filters. The coefficients presented by ITU-R BS.1770-4 are defined for 48 kHz. These coefficients are recomputed for nonstandard sample rates using the algorithm described in . Acoustical Society of America. Design Response of Weighting Networks for Acoustical Measurements. ANSI S1.42-2001. New York, NY: American National Standards Institute, 2001.
 International Electrotechnical Commission. Electroacoustics Sound Level Meters Part 1: Specifications. First Edition. IEC 61672-1. 2002–2005. International Telecommunication Union. Algorithms to measure audio programme loudness and true-peak audio level. ITU-R BS.1770-4. 2015. Mansbridge, Stuart, Saoirse Finn, and Joshua D. Reiss. "Implementation and Evaluation of Autonomous Multi-track Fader Control." Paper presented at the 132nd Audio Engineering Society Convention, Budapest, Hungary, 2012.